RazorwireUk is a trading name and sub division of SAE Systems Ltd, the information below is offered simply as advice based on our knowledge and experience of the subject matter and is not presented as a qualified legal opinion. For further reassurance or if in doubt we would ask that you seek professional legal advice on the subject matter. Q: Are Wall spikes and Razor wire legal? The simple answer is yes, however there are several factors that should be considered before fitting. Although razor wire and wall spikes are very effective deterrents to intruders, careful consideration should be given to mitigating your liability should anyone injure themselves whether innocently or not whilst on your property. There are several laws on the matter one of which is the Occupiers Liability Act 1984 which basically states that anyone who owns, or controls property has a legal duty of care to protect people on the property from foreseeable harm. This duty extends to people on the property without permission – including burglars and vandals. 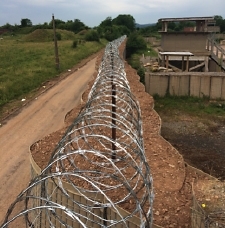 To help discharge this duty we would always advise that clear warning signs such as “Danger Razor Wire or Danger Wall spikes” etc are fitted at sufficient intervals that they are undeniably visible and present a clear warning to potential trespassers of the hazard. Additionally these signs should be of sufficient design that they wont deteriorate with time and are robust enough to withstand prolonged inclement weather and sun bleaching. Additionally the Razor wire or wall spikes should be located in a position that they are clearly visible, setting a trap or camouflaging the products would almost certainly create a potential legal issue should an intruder be harmed as a result. Of course, it is not only intruders and trespassers who risk being injured by the Razor wire or Wall spikes. Householders owe a much greater duty of care to anyone on the property with permission including guests and people who have implied permission, such as the postman. Consider the danger posed to any children who may be visiting the property. If a child was injured after climbing on a wall fitted with Razor wire, the householder is very likely to have breached their duty of care. The Criminal Justice Act 2003 provides some protection to householders. For instance if a trespasser suffers an injury during the course of a crime, for which they are subsequently convicted for, they will only be able to sue the occupier or landowner with the court’s permission. If it can be shown that there were adequate warning signs and the deterrent was clearly visible this is unlikely to be given. Section 164 of the Highways Act 1980 states that barbed wire (or Razor wire) on land adjoining a public highway must not cause a nuisance to humans or animals using the highway. Anything placed below 2.4 metres high will usually be deemed to be causing a nuisance and the local authority can issue a notice demanding its removal. Q: What if my neighbours object to me erecting Razor wire? If it’s your boundary, your fence and you are the legal owner of both, provided the Razor wire doesn’t protrude into their property you are within your rights to erect it, however your duty of care extends to your neighbours as well and the same issues apply in terms of mitigating your liability. We would always advise that you consult your neighbours first, it may be that your are actually protecting their property as well, or that they would be happier if you installed a less obvious deterrent such as Flat profile Razor wire or Wall spikes instead. In some circumstance you may be contravening local by laws or local councils may insist the Razor wire is removed or requires some form of planning. Either way ultimately they may need to obtain a court order to force you to remove it. Q: Should I select clipped or unclipped Razor wire? 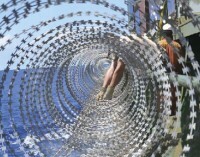 Clipped razor wire is the standard selected by NATO and Government organisations. 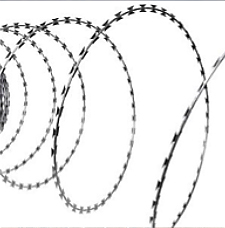 Unclipped razor wire otherwise sometimes referred to as “Helical” Razor wire is simply one single strand of Razor wire formed into a spiral, the problem with this is when extended a gap is created as in the image below, and intruders can spread the Razor wire apart and step through it. 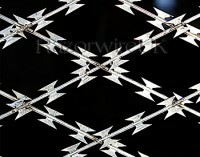 The Clipped Razorwire eliminates this and is therefore a better deterrent and obstacle. 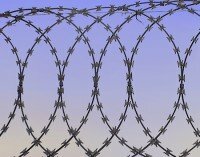 Q: How do I support the Razor wire? It all depends on the length of the boundary you are fitting it to, what size diameter Razor wire you are using and what the wall or fence is made off. In some scenarios you may need bespoke brackets to provide sufficient support and anchorage to allow the support wire to be tensioned. If in doubt please call us we will be happy to offer advice. Q: Is Razor wire suitable for segregating cattle? The answer is emphatically no! Razor wire is not the same as barbed wire which has limited puncture/cut properties, Razor wire is designed for perimeter defence against human intruders, use of Razorwire bordering fields to segregate cattle will cause injury to the cattle or livestock. Q: Can I use other cheaper forms of PPE? From our perspective as a supplier of Razor wire we can only supply PPE certified fit for purpose, Class 4 puncture resistant PPE is deemed appropriate for use with Razor wire, Wall spikes and other sharp objects. Manufacturing a material system that has this level of puncture resistance is difficult and involves expensive base materials and testing to achieve. The Razorpro product range has been developed especially to be affordable. Similar class of products produced by other manufactures retail for 2 and 3 times the price. 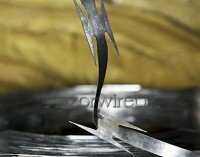 Q: Can RazorwireUK carry out the installation? Yes indeed, we have a team of mobile fitters who cover the UK and we would be more than happy to give you an estimate for installation. Please give us a call with details of the length and height of the perimeter and we will discuss the job with you. If you are able to send us pictures via email of the boundary/fence etc it can be really useful in assessing the installation.